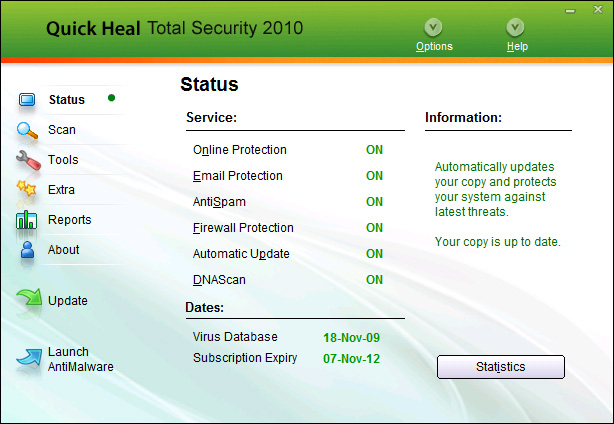 Last update 7 Sep. 2015	| old versions Licence Free to try	| $52.00	OS Support Windows XP	Downloads Total: 211,364 | Last week: 36 Ranking #12 in Antivirus Software Publisher Quick Heal Technologies Pvt Ltd.
Network Protection will be ideal for users having Cable or Broadband Internet connection. This feature will hide their system from Network/Internet. Thus, the unauthorized access to shared folders can be easily avoided. To allow specific system, range of systems of your network to access your shared data, you can just simply add them into Trusted IP list. So the trusted systems can only access you and the shared data. This feature will also help to block the Backdoors from infecting your system.